It is my pleasure to endorse a book designed to help Christian educators who work within the public school system. Rules of Engagement will help strengthen your resolve to become a more visible and vocal witness for Christ in your role as an educator. We all know that teachers have a great opportunity to mentor and mold young minds. For many children, a Christian teacher may be the only witness for Jesus they encounter. What a golden opportunity to use your platform to ensure they encounter Him through your words and actions. 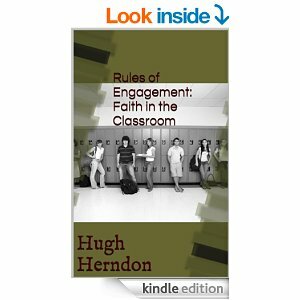 My nephew, Hugh Herndon, has written this book from his heart as both a teacher and a follower of Jesus Christ. Grab a copy for yourself, teachers from your church, or friends who teach. Recently our old refrigerator bit the dust, forcing us to shop for a new one. The most interesting thing about the new model we purchased was a function called “Sabbath mode.” Sabbath mode apparently turns off the interior lights, temperature control and advanced features. The compressor runs only on a timed defrost as well when in this mode. This unique feature got me thinking — do we have a Sabbath mode? I understand that we are no longer under the Law of Moses. In fact, as Gentiles we never were. The Sabbath, though, was a gift of God to mankind. The Sabbath was made for man, not the other way around. It was a day to cease from ordinary labor and use the time to ponder, reflect and communicate with our Creator. It allows us to become refreshed in both spirit and body, giving us much needed rest and strength to handle an increasingly busy life. If my refrigerator can have a Sabbath mode — why can’t I? Why can’t I take a day and cease from all the ordinary busyness of my life to focus on my relationship with my Savior? I know, I know, we have church on Sundays, our “day of rest.” Except it isn’t for far too many of us, especially those of us in full time ministry or who are leaders in our church. Sunday for us is the busiest day of the week. We need a real Sabbath. Maybe even a Sabbatical, which I would encourage all churches to give to their pastors. Some years ago I read a wonderful pamphlet called, “The Tyranny of the Urgent by IVP.” You can read it online at https://bible.org/seriespage/appendix-tyranny-urgent. I would encourage you to take the time to read this and to begin to institute a Sabbath mode into your own life. Not out of duty, guilt or to try and keep the Mosaic Law. I would love to see you enter a Sabbath mode just because you desire to spend time with your Lord Jesus Christ. Let Him refresh you, let Him restore you in both body and soul.